Hi there! Today I’m up on the SugarPea Designs blog, sharing how I made these sweet little treat holders for Valentine’s Day! Check out all the details HERE. Hello and Happy New Year! It’s been a while since I’ve stamped due to the hustle and bustle of the holidays. With the new year comes a fresh sense of calmness, everything throughout the holidays went off without a hitch, the house has been undecorated, and some normalcy has been restored! I used the Caffeine Addict stamp set for my card. This set is perfect for so many people in my life, myself included! I used Distress Oxide and Distress inks (Vintage Photo, Walnut Stain, Gathered Twigs, Ground Espresso) to create the background paper, then cut it using the Birthday Journal Card and Card Front Element Builder SugarCuts. I added a piece of transparency behind the distressed card stock, then added some aqua colored sequins before adhering the card base. The Coffee To Go Cup SugarCuts were used to create the coffee cup. I hope you’ll make some time to play along with us this month! 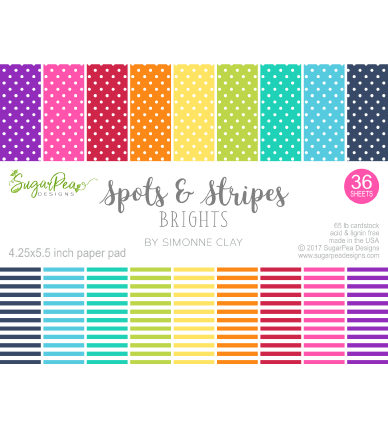 We always love to see what you create, plus, there’s a $50 shopping spree for the SugarPea Designs online store to be won! How much fun is this inspiration photo? I love that the Knit Wit set fits this challenge perfectly. I took the challenge quite literally and turned the balls of yarn from the Knit Wit set into ornaments. Any knitter will appreciate this kind of Christmas card right? 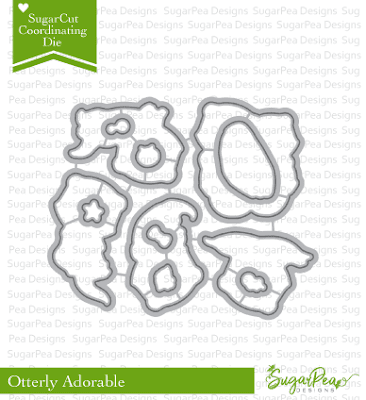 There’s also a SugarCut set to cut the images from the Knit Wit set out perfectly, so it makes this card super easy. I simply drew on the strings and bows and added a little bling. It’s hard to believe we’re less than three weeks away from Christmas! I hope in the hustle and bustle of the season you’ll find some time to make a card and join us, we love to see what you create! Plus, there’s a chance to win a prize and everyone loves free stamping goodies! Hello stamping friends! 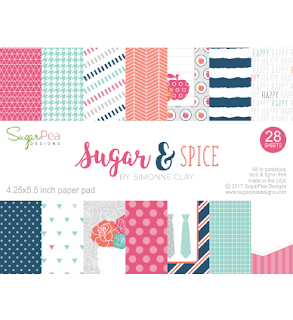 Today I’m up on the SugarPea Designs blog sharing these two cards using the Geo Floral CoverPlate SugarCut, Hello SugarCut, and with Distress Oxide Inks. Check out the details HERE! Hey stamping friends! It’s such an exciting time at SugarPea Designs, because it’s release week! Yahoo! It’s day 4 and that means tomorrow is the big day!! Today we’re highlighting the BoHo Feathers set along with the matching SugarCut dies, the Dare to Dream set, and Dreams SugarCut. I couldn’t resist getting inky with Distress Inks and this beautiful BoHo Feathers set! I embossed the feathers in gold embossing folder, and embossed the sentiment with black embossing powder on vellum. All links will go live and new products will be available tomorrow at 6 p.m. Eastern time! Thanks so much for stopping by! Be sure to come back tomorrow for the final sneak peek! 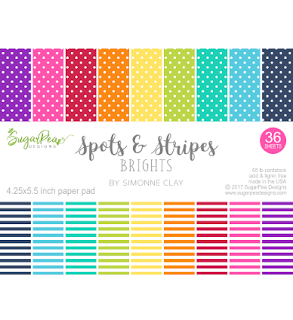 SugarPea Designs Winter Release ~ It’s Almost Time! I used the die to create a stencil, then applied distress ink in a fun color palette with some splatters for texture. I turned to one of my favorites for this release to finish off this card, the Hello SugarCut die (free with $60 purchase)…oh how I love this sentiment! The new release goes live at 6 p.m. Eastern time tonight!!! In the meantime, be sure to check out what the rest of the team has come up with! 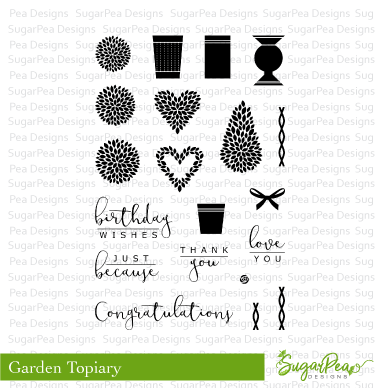 It’s day 4 of the Winter Release at SugarPea Designs and today’s set called Topiary Garden is another one that is perfect for so many occasions! 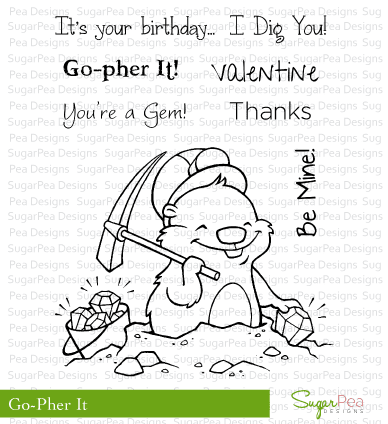 I used it to create a card that would be perfect for Valentine’s Day, an anniversary or a birthday! And, how beautiful is this font?!? I love it so much!! 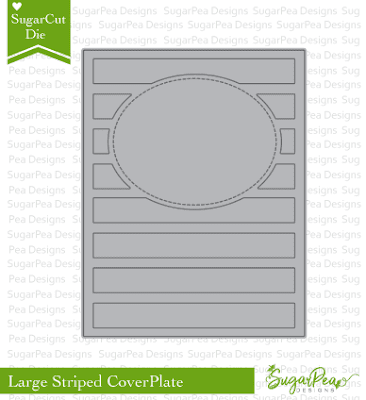 This set also has a matching SugarCut set that will make creating beautiful cards a snap! The new release goes live tomorrow at 6 p.m. Eastern time. In the meantime, be sure to check out what the rest of the team has come up with, and stop back tomorrow for our final day of sneak peeks! Hello! 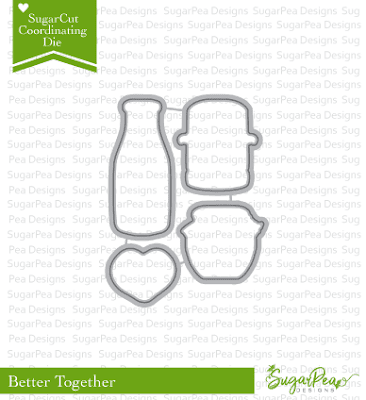 It’s day 3 of the Winter Release at SugarPea Designs and today we’ve got more amazing products to share! 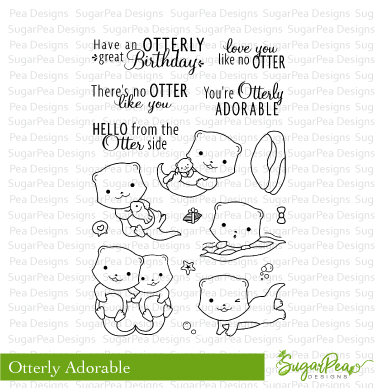 First up is the super sweet new set called Otterly Adorable. Is this cuteness overload or what?! 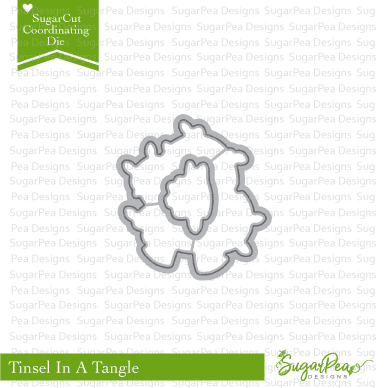 It’s so exciting that there is a matching SugarCut die set too, so no fussy cutting! I paired this little guy with the wavy die from the new Card Front Element Builder that is also being released this week. I used watercolor paper and distress inks to create a watery background. 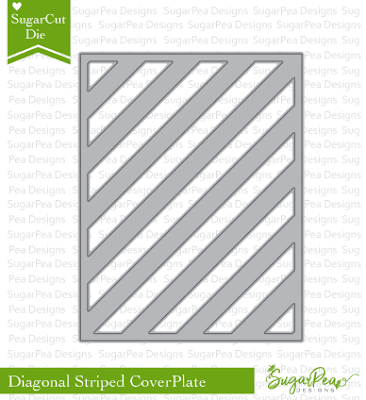 Next up is the fun new Striped CoverPlate SugarCut. I love that it has a panel built right in to highlight an image or sentiment! I used distress inks to create a fun splattered background before die cutting my watercolor paper. 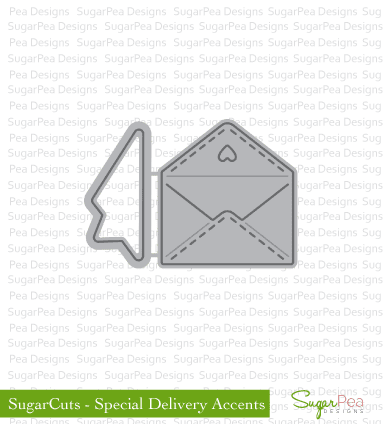 Then I added one of my favorites from this release, the new Hello SugarCut (free with $60 purchase). Finally I put clear acetate behind my die cut and added sequins for a fun shaker card. The new release goes live this Friday at 6 p.m. Eastern time. In the meantime, be sure to check out what the rest of the team has come up with, and stop back tomorrow for more sneak peeks! 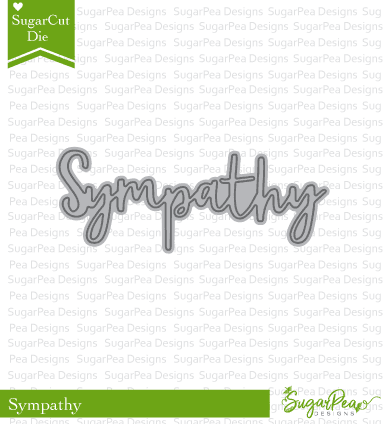 It’s day 2 of the Winter Release at SugarPea Designs and today we’ve got that special set that everyone needs in their collection…Heartfelt Sympathy. 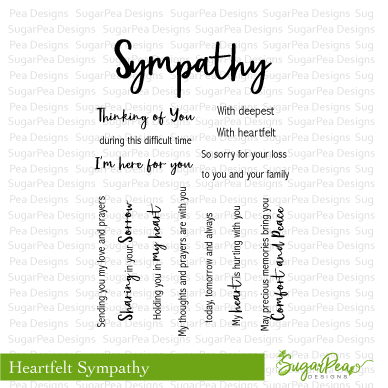 All too often we need the perfect sympathy card for a difficult time in someone’s life and we find that we don’t really have anything that suits the occasion. 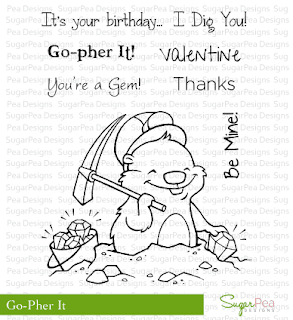 This set has got a huge variety of sentiments, and I chose to use almost all of them on my card! 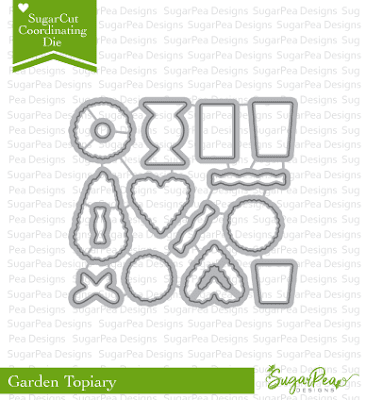 To go along with this timeless set is the Sympathy SugarCut Die. Woohoo! The day is finally here…the final day of sneak peeks and the day the product is available! 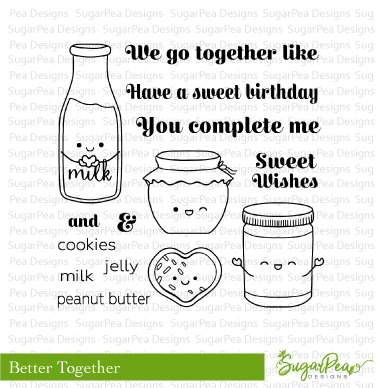 Tonight at 6 p.m. the new release will be live in the SugarPea Designs store! 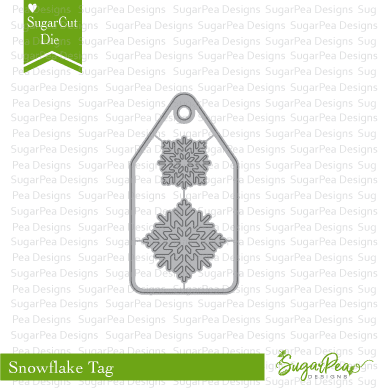 Today we’re featuring Christmas Tag Greetings, the Snowflake Tag SugarCut Die, and Tinsel in a Tangle with its matching SugarCut die set! Oh my gosh this little penguin wrapped in Christmas lights is too stinkin’ cute!